Visit any of the dozens of pizza parlors in the Lower Hudson Valley, from the cheapest grab-a-slice-and-go joint to the most authentic of old-world trattorias, and you’ll find plenty of people who believe that the perfect pie is a work of art. Few come as close to pizza perfection as the ones created by chef Chas Anderson and the staff at Burrata Wood Fired Pizza. Since it opened in 2012, the Neapolitan-style restaurant on White Plains Road has specialized in the artisanal techniques of northern Italy. It serves delicious pies fresh from a huge, gold-tiled wood-fired oven with the word “hearth” written across the top. The single-page menu offers nearly 10 pies. There’s also a selection of pastsa dishes, from Ricotta Ravioli ($17) stuffed with sheep milk ricotta and basil herbs to the Torchietti ($17) with English peas, smoked pancetta, cream and black truffle butter. Capra: a friseé salad with creamy goat cheese atop thin pancetta crisps, sliced fresh apple and sweet candied pecans. Costolette: Four Tuscan-style pork spareribs, seasoned with a porcini rub and served in a balsamic glaze. The ribs are tender and sweet introduction for the main dish to follow. Burrata: The titular ingredient lends this pie a rich, creamy opulence that balances nicely with a slightly charred crust that’s firm enough to support the wild mushroom toppings. It’s a superb —not soupy — pizza pie. There’s an impressive, well-edited Italian wine list and a sophisticated cocktail list. There’s still time to try a warm weather cocktail like the Aperol Negroni ($12), an Italian aperitif now in the U.S. It’s the sweeter, lighter version of Campari, served with a dash of gin, vermouth and a zesty shard of orange peel. Ahhhh! Nothing like a glass of Provencal Sangria ($10), a fruity cocktail that incorporates rosé into sangria with fresh fruits and veggies (strawberries, fennel and cucumber) and a load of ice. Get the Zeppole ($7) after dinner: four fried balls of dough with a side of sweet bourbon custard and candied pecans. A delicious, upscale cousin to the grease-and-air staple of the street fair. There is also Cannolo ($7), whipped fresh with ricotta with pistachios, and the Molten Chocolate Cake ($8). Young families early in the evening; an adult crowd later on. We went on a weekend evening and had no problem getting a table. Inside, you’ll find a polished homey space with butcher block tables, linen napkins, Mason-jar candles and spiced with the smell of wood smoke. Tables facing onto White Plains Road offer street views; toward the back is more private. Probably as good a place as any to sit. The wood-fired oven was built by third-generation master oven builders from Naples and, as per tradition, insulated with the volcanic soil of Mount Vesuvius. White Plains Road has been changing rapidly in recent years, with a mix of new shops and bistros. But it remains a work in progress. First-time visitors to the area may want to stop by The Vernon Hills Shopping Center, 700 Post Road (Route 22), in Scarsdale, features Banana Republic, Brooks Brothers, Lord & Taylor, Talbots and American Eagle among other stores. Great for: Date Night, Kid Friendly, Late Night Eats, Open Kitchen, Special Occasion Dining, Wine List. Hours: Noon to 3 p.m. and 5 p.m. to 10 p.m. Monday to Thursday; noon to 11 p.m. Friday and Saturday; noon to 9 p.m. Sunday. Go: 425 White Plains Road, Eastchester, 914-337-3700, www.burratapizza.com. Coals, Port Chester: You might think it silly to open a pizza place down the street from Tarry Lodge, which has some of the best pizza around. But Coals in Port Chester, the sister restaurant to one in the Bronx, has taken a different approach. They don’t try to compete; they embrace differences. Rather than 00 flour? A mix of cornmeal, flour and wheat. Rather than wood-fired? Grilled (with the grate marks to prove it). Rather than an extensive menu, loaded with a plethora of Italian-style entrees? American simplicity: Wings, soup, salads, sandwiches and a burger. (Just one.) There’s a scrappy Brooklyn-esque atmosphere, and it’s a great pre- or post-Capitol Theater destination. 35 N. Main St., Port Chester, 914-305-3220, coalspizza.com. 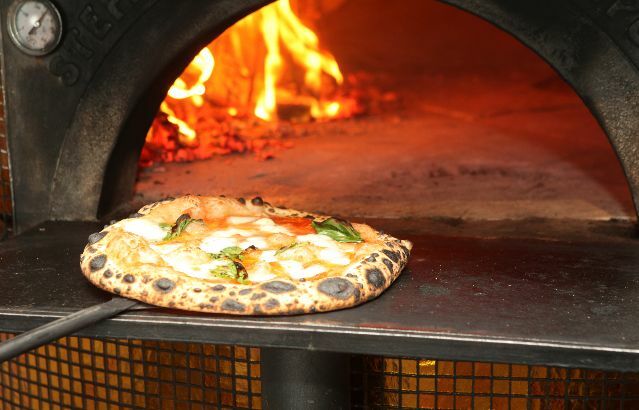 The Parlor, Dobbs Ferry: David DiBari, the chef-owner of The Cookery in Dobbs Ferry, opened The Parlor, a restaurant serving wood-fired pizza cooked in the same brand of oven that sits on the back of his traveling DoughNation truck. The restaurant’s look and feel couldn’t be more fitting for DiBari, who has a reputation as the bad boy chef of the Lower Hudson Valley. Its stripped-down decor has a chain-link fence along the dining area, corrugated metal covered in graffiti on the walls, burlap sacks on the seat cushions, and the menu matches the urban atmosphere. 14 Cedar St., Dobbs Ferry. 914-428-8200, www.theparlordf.com. o lar, Piermont: A homey, comfy and tiny spot with mismatched tables, a granite bar and a 4,000-pound pizza oven that serves as the hearth of the restaurant. The menu includes tapas, pizzas, pastas and wood-fired entrees, all served by the amiable owner, who makes you feel welcome, serves you some really good food and sends you away happy and well-fed. Try the lemon pizza, fresh out of the wood-fired oven. 587 Piermont Ave., 845-848-2207. Cash only.